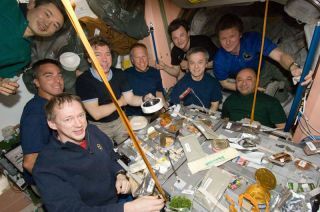 Nine of a total aggregation of 13 astronauts and cosmonauts are pictured at meal time aboard the International Space Station on July 21, 2009. Seated at the table, clockwise from bottom left, are Belgian astronaut Frank De Winne, NASA astronauts Christopher Cassidy, Mike Barratt and Tim Kopra, Canadian astronaut Robert Thirsk and NASA's Mark Polansky. From left to right at top are Japanese astronaut Koichi Wakata and Russian cosmonauts Roman Romanenko and Gennady Padalka. Not pictured are NASA astronauts Tom Marshburn, Dave Wolf and Doug Hurley, plus Canadian astronaut Julie Payette. TheInternational Space Station may feel a bit crowded with 13 people aboard, butthe population boost has also given it a multicultural flair, an astronaut saidSunday. NASAastronaut Dave Wolf, who once lived aboard Russia?s Mir space station formonths, said the space station is aninviting place. ?As you go throughhere, you hear different languages. You hear different music,? Wolf toldreporters in a televised news conference. ?It?s like going around the worldwithin a spacecraft that?s already going around.? The spacestation is currently home to its first fullsix-man crew and seven astronauts from the shuttle Endeavour, which broughtWolf and his crewmates to the station. That makes 13 in all - the largest singlegathering aboard the station. ?It?sreally fascinating to be here,? Wolf said. A spacetoilet broke down early in the joint mission, but was swiftly repaired aday later by the station crew to the relief of all 13 astronauts aboard. Theorbital commode was one of three aboard Endeavour (which has one) and thestation (which has two). But the astronauts were limiting themselves to justusing the two on the station to avoid filling Endeavour?s wastewater tank, whichcould not be emptied overboard because it could contaminate nearby stationhardware. OnSaturday, a NASA device used to remove carbon dioxide from the station?satmosphere went offline, but it has also been fixed. A spare air-scrubbingdevice was already planned to be delivered to the station during NASA?s nextshuttle flight in late August. Even beforeEndeavour arrived, the station was a diverse place. The $100 billion laboratoryis the product of cooperation between 16 countries. Its current six-person crewincludes two Russian cosmonauts, two Americans and one astronaut each fromCanada and Belgium. Until recently,Japanese astronaut Koichi Wakata also served on the station?s crew. He willreturn home aboard Endeavour after living on the station for 4 1/2 months. Butuntil he does, all five of the station?s major international partners - NASAand the space agencies of Russia, Europe, Japan and Canada - are representedaboard. ?We?ve puttogether a vehicle that is truly international; brought together a truly internationalcrew representing the whole world,? Wolf said. ?And now we?re undertaking perhapsone of the most spectacular engineering achievements that humans can everconduct. It?s just fabulous in many dimensions.? Wakatabrought 28 new Japanese dishes to add to the increasingly internationalcuisine aboard the station, which includes foods from the native countriesof each of the astronauts and cosmonauts. ?We evenmanaged to have dinner a couple of nights with our wonderful hosts here,"said Endeavour commander Mark Polansky. ?I think it's been an extremelysuccessful mission in spite of a lot of really interesting curve balls thathave been thrown our way.? Endeavour?ssix-man, one-woman crew is in the homestretch of a 16-day construction flightto the space station. The astronauts delivered Wakata?s replacement - NASA astronautTim Kopra - as well as a new Japaneseexperiment porch and spare parts for the outpost. Theastronauts will perform their fifth and last planned spacewalk for the missionon Monday and leave the space station on Tuesday. Endeavour is due to return toEarth July 31 and land in Florida. SPACE.comis providing continuous coverage of STS-127 with reporter Clara Moskowitz andsenior editor Tariq Malik in New York. Click here for missionupdates and SPACE.com's live NASA TV video feed.